Lisa Dieker went around the room asking her middle-school students what they did over the weekend. CJ went to see the movie “Here Comes the Boom” with her boyfriend. Ed played in a basketball game and Kevin posted new dance videos to YouTube. “Did you work on any art projects?” Dieker asked Maria, a girl bent over a textbook in the back row. “And what were you working on?” Dieker said. It sounded like a typical way to kick off a Monday morning class. 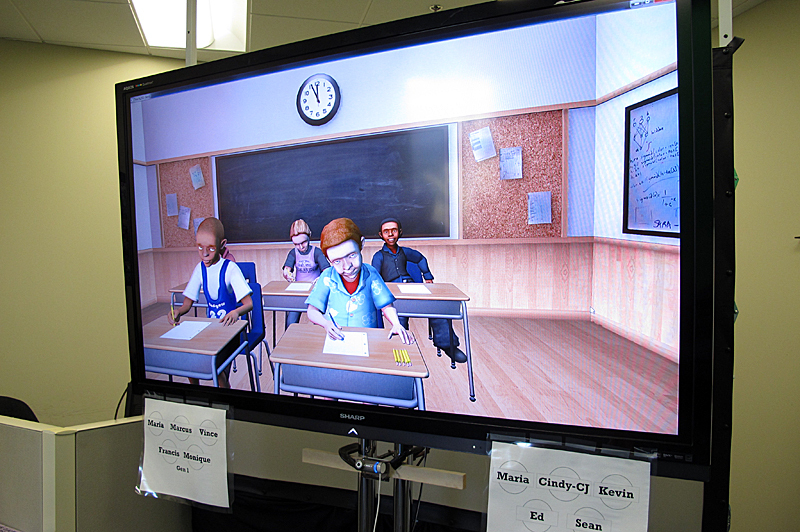 There was just one catch: Dieker’s five students weren’t real; they were avatars projected on a screen. She talked to them through a headset and they responded. As Dieker, a professor at the University of Central Florida’s (UCF) College of Education, moved around, her view of the virtual classroom changed. Started ten years ago, the so-called TeachLivE lab was developed by faculty in the education school at UCF, and at least 22 other universities across the country have opened their own labs using TeachLivE technology. Much like a flight simulator trains pilots, faculty use the virtual classroom to train teachers-to-be by helping them isolate and master strategies like higher-level questioning or behavior management. Dieker and her colleagues estimate that―just like in a flight simulator―10 minutes in the simulator is equivalent to one hour in the classroom. Teachers-in-training can practice a specific lesson or skill over and over again. Studies conducted by UCF faculty have shown that after four 10-minute sessions in the simulator, teacher candidates have changed the way they operate in the classroom. Right now, UCF faculty members who want to bring classes into the lab must submit lesson plans two weeks in advance so Dieker and her colleagues can program the system to make sure the avatars make mistakes. The software collects data during each training session, tabulating how much time the teacher spent talking to each student. It also records how the teachers responded to certain behaviors so that teachers can review their reactions afterwards. The avatars, always the same students Dieker was talking to, are fed information on a daily basis― weather, pop culture information, results of sports games―to help them carry on realistic conversations. Each of the avatar students has a distinct personality meant to mirror what teacher candidates might find in the classroom. Sean is the classic overachiever; he’s got an extra four pencils lined up on his desk “in case I break one.” CJ is more difficult, slouched in her chair and more reluctant to participate. Right now there are only the five middle-school avatars, but those in charge of the virtual classroom said eventually they would like to expand to different grade levels as well as into principal training.